a Generation Next application to address all your office needs. OPPORTUNITIES ARE RARE, DON'T MISS ONE. OfficeGx has both a web app and an android app to make your website easy and always available. A perfect way to manage your project with complete control on teamwork progress and work reports. Its integrated and seamless range of mechanisms, the project management system can keep up your work with useful features such as Work History, Work Estimates, Custom Filters, Reports and more. It is an innovative way of increasing the work productivity by monitoring and tracking the time log of employees using the reporting log entries accurately. The most attractive feature in this system is Face recognition gives an authenticated time tracking reports by capturing the photograph. The customer relationship management module offers end to end integrated process that helps you increase the efficiency of managing your customers, leads, and Accounts and never miss a business. Just connect with the OfficeGx for CRM and you can Integrate and run your business on any device. A user-friendly interface for creating Banners and even a non-technical user can master the Ads within a few sessions. You can track clicks and impressions accurately and schedule the visibility within a specific date you have scheduled. It is very helpful to manage the widgets more easier. Manage your company information, branding, SEO and many others in one place. This module allows you to handle employee profiles and their organization roles. It also generates detailed audit reports on the user activities. Optimize your Office Management with OfficeGx User Management system. A power packed CMS allows you to create, edit, schedule and publish your content. It gives the power to optimize the Url and tags and keeps your SEO on track. It includes Versioning, Role Based visibility and many modern search engine concepts like open graph and much more to manage content. 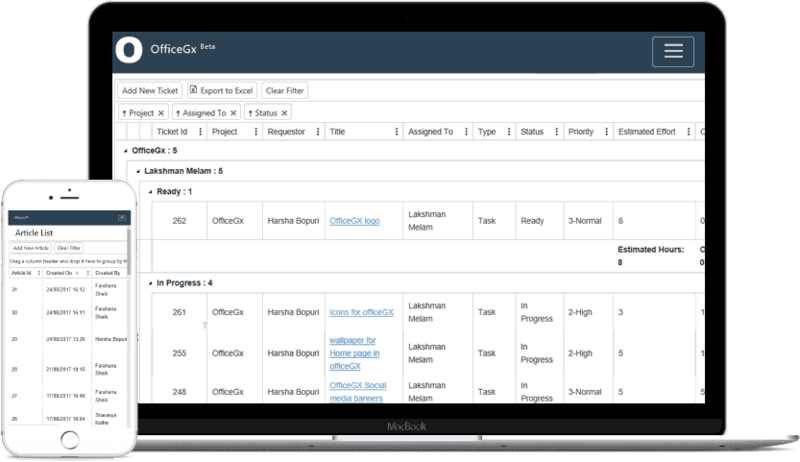 OfficeGx is an advanced automation tool that helps your organization to streamline all your day to day activities in a most effective manner. This application is designed to support any smart device which can help you to carry your office with you! OfficeGx is a highly secured platform with SHA-2 and 2048-bit encryption – the strongest in the market. Any information on this system is kept confidential and used with a great sensibility of individual/organization trust. Great elastic User Interface that scales itself to any device and make it consistent across all the platforms. We believe that organization’s identity is one that should stay as one. Our cloud based service makes it easy to access from anywhere and anytime - all you need is internet. Due to its portable optimization, this application can run on any smart device, which indeed helps our customers to carry their office with them anywhere any time. It is the minute details that play the most significant role in the making of a successful tool. OfficeGx is one of its kind which has gone through multiple iterations of detailing to the best satisfaction of its targeted customers. OfficeGx offers a varied range of modules in collaboration with a diverse systematic set of office needs.Works seamlessly on all browsers and enhances user experience on the go. Ceaseless transaction pathways between clients and users improving their overall experience anytime, anywhere. A fringe benefit - avail new components that come included! OfficeGx is an advanced office management solution programmed efficiently for desktop, tablet and mobile devices. Setup your Company smooth and sailing always through OfficeGx in less than a minute. "Wide range of tutorials explaining each and every nice feature of OfficeGx. It is easy to learn, easy to setup and easy to use. Follow our YouTube channel for all latest updates (including Beta features) and watch tutorials on how to configure and use OfficeGx."